Light the path ahead and support America's heroes in the process. With every Streamlight Red Nano Light® sold, one dollar will be donated to the National Fallen Firefighters Foundation®. Each flashlight comes with a double-sided fob with the NFFF logo proudly displayed in support of our nation's firefighters. 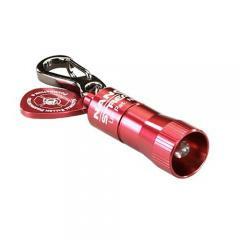 Part of Streamlight's keychain series, the flashlight measures less than two-inches in length for a virtually unnoticeable addition to any key set. A long lasting white LED light produces a 10 lumen beam, ideal for quick searches or changing fuses in the dark. A machined, aircraft-grade aluminum body protects the Red NANO from impact shocks. A non-rotating snap hook allows users to easily detach the light from their keys for more versatile use. The compact light is powered by four IEC-LR41 coin cells, for an impressive eight-hours of battery life.